How to Grow Basil | Grow This! Basil is a bush plant grown for its leaves, which are harvested as an herb best known as the primary ingredient in pesto, though it has a large culinary repertoire. Here are some instructions on how to grow basil at home. Basil comes in dozens of varieties. Some are best for cooking while others are more decorative. Sweet basil, purple basil, cinnamon basil and “Round Midnight” are just a few interesting varieties to consider. They’ll vary slightly in size and more dramatically in color, taste and aroma. Plant basil only after the danger of frost has passed, usually about 2 weeks after the last frost date for your area. You can get a head start by sowing basil seeds indoors several weeks early or purchasing healthy starter plants to set in your garden. Basil is an annual and should be replanted every year. Basil can be grown outdoors where temperatures are around 70° F during the day and do not drop below 50° F at night. They should be planted somewhere they will receive at least 6 hours of direct sunlight per day. Basil can also be grown indoors, but you will need to pay close attention to the amount of light and water the plants receive. A grow light may be necessary if you do not have a sunny enough window. Basil should be planted in a loose, well draining soil that has been enriched with lots of mature compost. Be sure the pH is 5.5 – 6.5. If growing indoors, try a planting in a good potting mix. Basil can be grown from seed but is easiest if started from healthy seedlings. Set transplants about 12 inches apart. Be sure to moisten the seedlings and soil before transplanting. Best to harden them off by introducing them gradually to the outdoors over the course of a week. 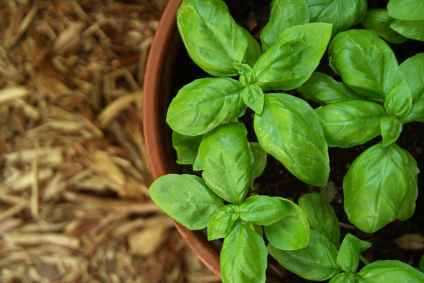 When growing basil from seed, sow seeds thinly (1/4 inch deep) in warm, moist soil about ½ inch apart. Use a spray bottle to keep the soil moist without flooding the seeds. Transplant or thin to 12 inches between plants once they reach 2 inches tall. Basil grow from stem cuttings will grow much faster than basil grown from seed. Take a 4 – 6 inch cutting and place the bottom half in water. After a few weeks, you will have well established roots. Plant into a 4 inch pot and let it get established in the potting soil before transplanting outdoors. Water basil regularly to keep the soil consistently moist. Container grown basil plants will need to be checked and watered more often. Water at the base of each plant, keeping the leaves and stems dry. This will help prevent mildew and other diseases that can be caused by wet foliage. Prune basil plants throughout the growing season. Pinch off the tips of the stems, even when you’re not harvesting. This will keep the plant from flowering. Or cut off the flowering portions of the plant just before they begin to flower. Flowering basil plants produce less edible and highly bitter leaves. When harvesting a lot of leaves, your basil plants will need fertilizer to keep producing a quality amount of fresh leaves. For outdoor plants, feed them 2 – 3 times throughout the growing season. Indoor plants can be fed more frequently with a light organic fertilizer or compost tea. Liquid kelp is great for indoor basil plants. Fertilize if the leaves begin to turn yellow. Harvest can begin after the plant grows to at least 6 – 8 inches tall. Pinch off the leaves you want from the tips of the stems. For best flavor, harvest just before the plant’s flowers begin to bloom. Harvest all basil before the first frost of fall. Good drainage is the key to successful basil plants. Dry soil stunts basil plants. Use a heating pad to help germinate basil seeds indoors. Do you have tips on how to grow basil? Let us know in the comments section below.